Monday 4 February, the UK parliament will debate the issuing of a compulsory licence by the government, called ‘Crown use’, for the cystic fibrosis drug lumacaftor/ivacaftor (Orkambi) sold by Vertex Pharmaceuticals. The topic was put on the agenda by Member of Parliament, Bill Wiggin. In a statement he said, “I am challenging the Government to take the opportunity to use a legal device to overrule the patent which manufacturers Vertex hold. This is because Vertex refused the largest ever financial offer the NHS has made in its entire history for this medicine.” Vertex rejected an offer by the National Health Service (NHS) of a £500 million payment for a five-year period for Vertex’s cystic fibrosis medicines. The list price in the UK for Orkambi is £104,000 per patient per year. The 10,000 cystic fibrosis patients in the UK are considered an important market for Vertex and the conflict about the price has been in deadlock since 2016. The company claims to have offered the best price to the UK but this price offer is kept secret and it is not possible to independently verify this claim. Currently, the product is not available in the NHS and patients do not have access to the treatment unless they pay out of pocket. At the current price this is likely to be impossible for most if not all patients. A ‘Crown use’ license that would enable the government to seek lower priced suppliers could change that situation. The parents of children with cystic fibrosis, working with access to medicines campaign group Just Treatment, are behind the call on the government to suspend Vertex’s monopoly so a generic version of the medicine can be bought by the NHS. Just Treatment says the generic price could be less than £5000 per patient per year. “It is really important that UK parliamentarians are stepping up in the fight to get access to Orkambi at a fair price fo the NHS. Thousands of children and young people are waiting for a treatment that could add years to their lives, yet Vertex are preventing them from getting it by cynically holding out for an unjustified high price. We should not allow them to get away with holding children’s lives to ransom and MPs are absolutely right to demand the British government uses it power to issue a Crown use licence to get a generic version of the medicine in order to protect the young lives of its citizens” says Diarmaid McDonald, lead campaigner at Just Treatment. Also see the reporting by Stat+ and the report by the Guardian. Last week, Vertex took legal action against the Dutch minister of health for including the UK in the list of countries used to determine the official maximum price of medicines. This is called ‘reference pricing’. 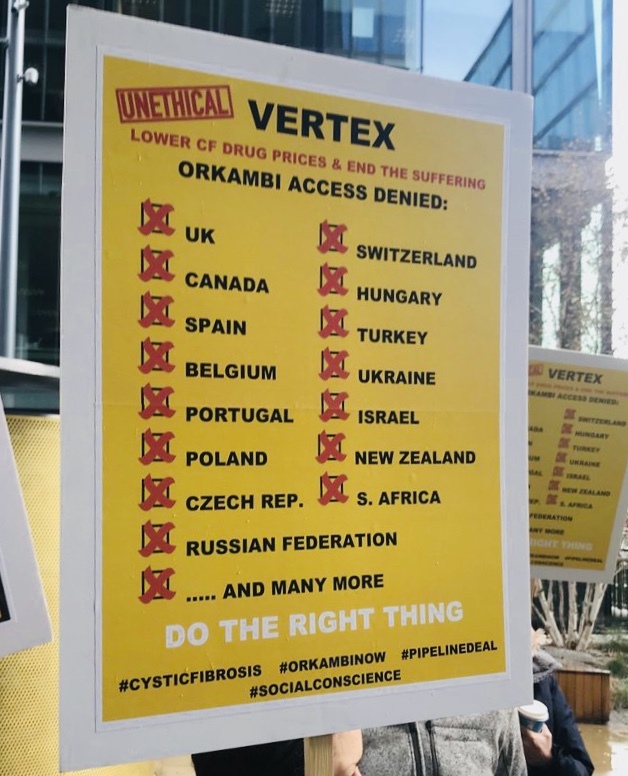 According to the Dutch newspaper Financieel Dagblad, Vertex argues that the UK should not be included as one of the reference countries because Orkambi is not reimbursed in the UK, which is of course a situation that results from Vertex’s own pricing policy. It is unclear why Vertex is taking this legal action now, considering that in October 2017 it reached a price agreement with former health minister Schippers. Orkambi has since then been included in the basic care package and thus reimbursed. Vertex initially asked €170,000 per patient per year in the Netherlands. The Dutch Care Institute determined that the treatment would be cost-effective only after a 82% price reduction, which would have brought the price around €30,000. Pharmacies in the Netherlands are allowed to produce medicines, including patented products, for their own patients. On 16 January 2019, pharmacist Paul Lebbink opened a production laboratory in his pharmacy in The Hague in the presence of Health Minister Bruins. Lebbink announced that he would prepare a cheaper version of lumacaftor/ivacaftor (the active ingredients in Orkambi) should the need arise or should the minister ask him to so.